Remotely reboot and SSH to any device across your enterprise LAN/WAN. Manage all your WTI devices from a single software solution. The WMU provides fast and easy management of all WTI devices on your LAN/WAN via a single, centralized control interface … and the best part is that it’s included free of charge with all WTI console server and PDU products. Want to change a username or password across all your WTI devices? Quickly reboot unresponsive devices or establish an SSH connection to your network gear? Manage everything from firmware updates to asset tagging and more with WTI's enterprise software solution. A convenient installer program streamlines the process of deploying the WMU on your PC. After installation is complete, users can perform a quick search to find all compatible WTI devices on the network and then add those devices to an inventory display for later access. The WMU can locate all devices within a user-specified range of IP addresses, or known IP addresses for WTI devices can be imported from a file. The WMU provides two unique features that help to simplify the task of finding a specific WTI device within a large inventory of devices: the search function and the device grouping function. The search function can be used to locate a particular WTI device in inventory based on that device’s IP address, unit type, site ID message, port or plug names or descriptive tag. Each search can be set up to find units based on information harvested from each WTI device (e.g., Site ID, IP address or unit type,) or find units based on descriptive tags that have been defined via the WMU’s control interface. Descriptive tags can denote the location, function, departmental ownership or other criteria for the corresponding WTI device. 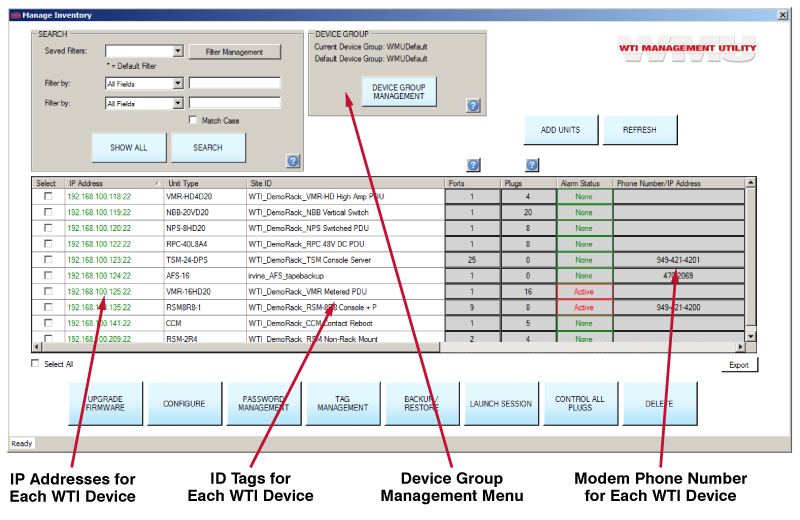 The device grouping function allows administrators to sort WTI devices in WMU inventory into concise user-defined groups. Groups can be based on the location, rack number, function, product type, departmental ownership or other criteria regarding each WTI device. Once WTI devices are sorted into groups, specific units can be quickly located within the group, cutting the time required to access power control and console port access. 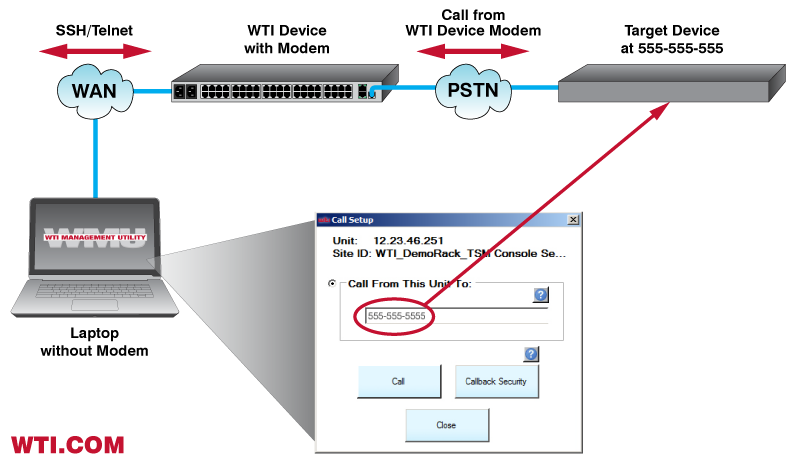 After the desired WTI device has been located, administrators can quickly create an SSH, Web or dial-up connection to the unit via the WMU’s inventory menu. This provides administrators with rapid access to console port command functions or power reboot capabilities for routers, switches and other network elements connected to the WTI console server or switched PDU. In applications that include multiple WTI power control units, the WMU provides fast access to power switching and reboot functions without the need to log in to each individual PDU in order to switch power or initiate a reboot on connected equipment. Outlets can also be assigned to groups according to functionality or location and then switching and reboot commands can be applied to all power outlets in the group. Outlets on a user selected combination of different WTI switched PDU products can be assigned to a group in order to allow all outlets in the group to be switched or rebooted by a single command. This feature is particularly helpful when rebooting or switching power to a network device that draws power from several different WTI switched PDUs. In order to simplify the process of finding a specific WTI device or group of WTI devices, the WMU allows you to sort WTI units in WMU inventory into device groups. Each device group can be based on the location, function, rack number or other criteria for the devices in the group. Once WTI devices are sorted into device groups, this drastically simplifies the task of finding a specific WTI device within a large inventory of devices. Device groups can be created which contain all devices in an individual equipment rack, all power control devices at a specific data center, all devices owned by a particular department or any other criteria imaginable. The WMU simplifies the task of updating user accounts by enabling administrators to update user account information on multiple WTI devices from a single, convenient interface. This saves time and ensures consistency by eliminating the time consuming task of accessing each individual device in order to change passwords or usernames. When new firmware updates are available, the WMU allows multiple WTI units to be updated via a single command. Administrators can simply select the desired WTI devices from the inventory menu displayed by the WMU, specify the desired firmware update file and the WMU will do the rest of the work, updating each selected unit. When a remote WTI device equipped with an internal modem is added to the WMU’s inventory management screen, admins and support personnel can then use the remote, modem-equipped WTI device as a kind of “modem server.” This allows users who do not have immediate access to a modem to create an SSH or Telnet connection to the WTI device and then employ the device’s modem to dial-out to a user-defined phone number. In addition to providing a clever way to avoid long distance calling charges, this also eliminates the hassle of setting up a dial-up modem on your PC, laptop or tablet. Once the WMU has identified all compatible WTI devices in your network, identifying tags can be assigned to each device in the WMU’s inventory, making it easier to locate devices with similar tags or characteristics. In addition, individual power outlets and console ports can also be tagged to denote function, location or department. After tags are assigned to each WTI device in inventory, search functions can be used to quickly find a specific device or several devices. When user defined alarms are trigged at WTI devices in the WMU’s inventory, the WMU will report those alarms via its control interface. If rack temperatures, current consumption, power supply irregularities, ping response or monitored events and conditions exceed user-defined triggers, the WMU inventory menu will immediately provide notification that an alarm is triggered. When an alarm is displayed on the WMU inventory menu, administrators can click the alarm status column to quickly access additional information regarding the reason for the alarm. The WTI Management Utility (WMU) allows you to manage multiple WTI units from a single centralized interface. The WMU eliminates the need to individually access WTI units in order to perform firmware updates, control power switching functions, edit user accounts and perform other functions.